$10.00 Off Purchase Of 2 JR Ultimate Boxes! 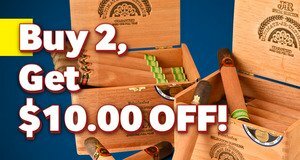 Buy 2 Boxes of JR Ultimate Cigars, get $10.00 Off! Note: Must buy 2 boxes to receive discount.